Coffee Terrace is one of the most spacious dining restaurants at the Resort World Genting. Me and my Little Angels had the privilege to dine-in at the restaurant and indulge ourselves with the sumptuous spread of buffet treat. Featuring four sections i.e. Private Room, Lanai Bar, Nyonya Baba Corner and Alfresco Terrace, the premise can accommodate up to 600 diners at any one time. 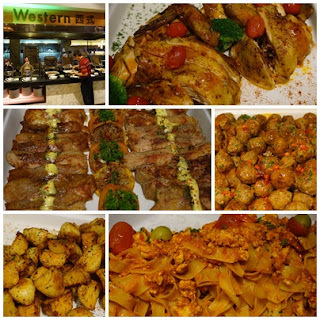 The daily buffet special is from 1 November to 30 November 2015. Buffet Lunch from 12 noon to 2.30pm. Price on normal days at RM38 nett (Adult) and RM19 nett (Child) for normal days. For public holiday and eve, then the price will be RM50 nett (Adult) and RM25 nett (Child). 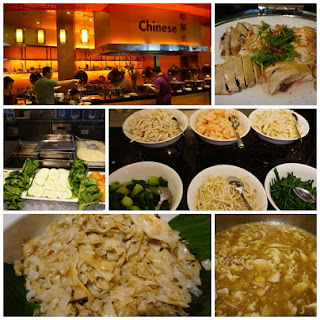 Buffet Dinner from 5pm to 9.30pm. Price for Sunday to Thursday at RM80 nett (Adult) and RM40 nett (Child). Normal days will be RM71 nett (Adult) and RM35.50 nett (Child). For Friday & Saturday, the price will be RM84 nett (Adult) and RM42 nett (Child). For more information and details, please visit their website HERE. My Little Angels' favourite were Satays, Fish Chop with mushroom sauce, soup, satay, sweet desserts, ice cream, pancake, fried kuew tiau and many more while my favourite was steam chicken, petai sambal belacan, curry fish head, chocolate cakes and mango sorbet ice cream. Few chefs were stationed at different section to ensure all the food was freshly cooked and delicious always. 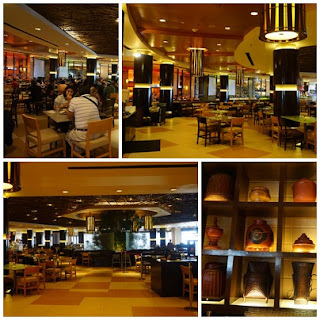 We just love all the food here and been pampered for a day to savour everything that we wish for in a breezing cold environment at Resort World Genting. Yummy food.. Great variety! I always love to dine in Coffee Terrace! Mak aih banyaknya makanan mampu tengok je.m makan banyak banyak nanti tak dapat bernafas. I love eating here. So much food that I can choose from! Trislynn, come as now got promotion at RM38 for normal days. Fish, I love it too. 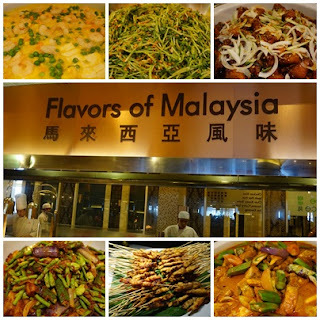 Consider cheap for a buffet at a reputable restaurant up at Genting. Adeline, sorry for that. Hope you'll have a great dining experience at Coffee Terrace. so yummy food, we nonstop nom nom. love to eat the satay! Sherry, my little angels love satay too. oh gosh! i missed this one. You sure have a great feast up there! Cindy, we had lots of fun eating with so many choices available. The food was good. Didn't get to try all because there were too many varieties. The food spread looks huge! And RM 38 nett per pax is rather reasonable though. Renae, consider cheap with so many choices to choose from. Lotta food variety! It's worth to have meal there with just RM 38. Blueberry Sorbet!!! OMG just look at the colour! It can say how delicious the ice cream is already. Geng Qian, this is my favourite too. Even up to this day, I never really enjoy the buffet spread from Genting, maybe because i felt that they are catered mainly to gamblers so taste wise, it's just so so. Mike, you should try it again. Food here really met the expectation. Miera, me too and price affordable too. Arisa, the chefs there cook quite often when the food almost finish. Not much wastage. the food range is huge! going to try it soon! Wendy, you going to love it. Isaac, thats true. We had so much fun dining together. that's a lot of food for everyone. must be great fun to dine there in the cold cold weather. Leona, really fun as we are hungry too as cold weather made our digestion fast. 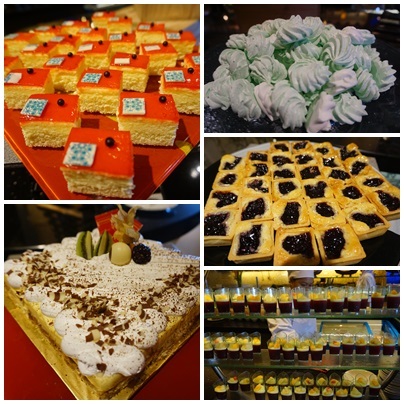 Oh my... so many delicious food, must be enjoying yourself with your family in Genting Highlands. Kelly, we enjoyed it very much. Ivy, come and try the dessert and I'm sure you'll love it too. Just look at those foods! Im drooling all over. and for me the price is reasonable too! They do not lie when they mentioned spread - the food was so much that it is hard to choose.